Seven of the 91 European banks that underwent stress tests have failed the healthchecks, the Committee of European Banking Supervisors (CEBS) has said. They include five Spanish banks - Diada, Espiga, Banca Civica, Unnim and Cajasur. The other two were Germany's Hypo Real Estate and Greece's ATEbank. The tests assessed banks' ability to survive future economic shocks. 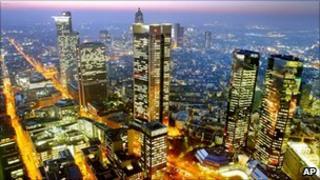 The seven banks would need a total of 3.5bn euros (£3bn) of new capital to meet the standards required, CEBS said. "[The failed banks] will have to agree with their respective supervisors a plan over a given time period which will explain how this weakness will be resolved," CEBS chairman Giovanni Carosio said. BBC business editor Robert Peston said that on the face of it, the results appeared to be "good news", but questioned how severe the tests were. The weekend will be an anxious time for banks, as they wait to learn whether it will become easier or harder for them to borrow, when markets open on Monday, he added. Some analysts are already arguing that the tests were not strict enough. "What seems to have occurred is a compromise amongst European banking regulators, with many questioning if the bar had been set way too low in testing the European banking sector," said Mark O'Sullivan of foreign exchange firm Currencies Direct. "It seems the tests may have raised more questions than they have answered and in the coming weeks, it will be the interbank lending markets that will have the real answer as to whether real confidence has returned to the European banks." But Vitor Constancio from the European Central Bank said the tests were very extensive. The stress tests were conducted on a bank-by-bank basis, in a move designed to reassure investors over the health of Europe's financial sectors. The most severe test looked at an adverse scenario, assuming a "double-dip" recession over the next two years, as well as a sovereign debt shock - some kind of financial crisis for European governments such as Greece. Media captionVitor Constancio: "These stress tests are the more extensive and the more severe that have been conducted in developed countries on such a scale"
The seven banks failed because in this scenario, it was deemed that their "tier one" capital ratios - the strictest measure of capital - would fall below 6%, the threshold set for the test. In its report revealing the aggregate outcome of the tests, CEBS said that the 6% threshold was used as a "benchmark solely for the purpose of this stress test exercise". "This threshold should by no means be interpreted as a regulatory minimum... nor as a capital target reflecting the risk profile of the institutions." Banks that are supervised in the EU need to have a regulatory minimum of 4% tier one capital. CEBS added that failing to meet the 6% threshold did not mean a bank was insolvent. The UK's four major banks - RBS, Lloyds, HSBC and Barclays - were among the banks tested and all passed the tests, which were carried out by the Financial Services Authority (FSA) on behalf of the EU. "As expected, the outcomes of the stresses demonstrate the preparedness and resilience of the UK banks under unlikely adverse economic scenarios," the FSA said. "This resilience is a result of the considerable work that has been undertaken to strengthen UK banks in recent years." The British Bankers' Association said: "UK banks have already put in the work to rebuild their businesses and put more money aside against future financial problems. "It is no surprise to find they have exceeded the standards set out by CEBS." The five Spanish banks that failed, out of 27 tested, were regional savings banks, which racked up heavy losses following the collapse of the Spanish property market. Cajasur was bailed out by the Bank of Spain in May. Following publication of the stress test results, the central bank said in a statement: "The exercise confirms that the Spanish banking system is sound, and in turn substantiates the savings bank restructuring and recapitalisation process pursued over the past twelve months by the Bank of Spain." Meanwhile, 13 out of 14 German banks passed the tests. "The German banking system has shown itself to be robust and proved its resilience even under very pessimistic assumptions," financial watchdog Bafin and central bank, the Bundesbank, said in a statement. It added that the only German bank that failed, Hypo Real Estate, "is currently undergoing a far-reaching restructuring process".